I remember Bruni's from my highschool days,although it has changed hands the recipe is the same. When you walk in the smell is the same wonderful aroma. We have been here a few times in the last few months. The pizza isn't super cheap, but honestly, you get what you pay for! The pizza is fantastic! Sausage and Mushrooms and I'm good to go! Definitely worth visiting! Only great if you eat in. Heard a buddy rave about it so I finally went there and was not disappointed! Had a fresh made pizza and it was delicious! Will definitely be back! Bruni's used to have great pizza, now it's terrible. The pizza is very thin and the ingredients taste cheap. Definitely not what it used to be. I heard they sold it a few years back. That's what most likely explains it. 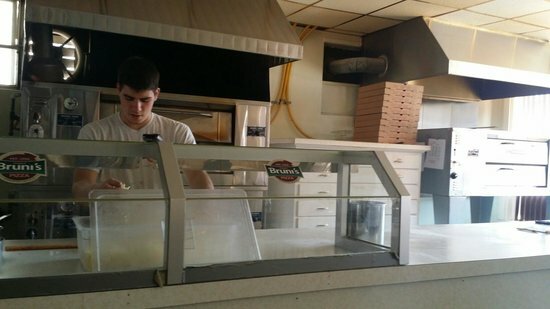 Get quick answers from Bruni's Pizzeria staff and past visitors.